Which is the correct way to calculate axial loads on concrete columns: tributary area, or analysis using continuity of the slab? Taking tributary area would overestimate loads in outer columns and underestimate loads in interior columns. However, ACI 315R-11 (which is limited to 5 story buildings) states: 9.9.1 Vertical reactions at columns and walls - Vertical reactions of the supporting members, Ru, should be determined as the total factored design load qu multiplied by the area bound by panel centerlines around the supporting member (Fig. 9.6.1). Maybe since it's limited to low rises, the "error" is within acceptable limits. But I have to design a 10 story building with lots of transfer slabs. I would use, and document, properly sized tributary areas that load columns in accordance with established engineering principles. Would never apply a generic interpretation of a code which I knew as inappropriate for conditions. Using tributary area method has been a day one for all engineers. I would recommend you use the tributary area. I also don’t think that this underestimates the loads on interior columns. Instead of using the 315-11, why don’t you use the aci318-11? Accounting for the continuity of the slab is the more accurate method. Trib area or modified trib area may well be accurate enough to be considered correct. But I have to design a 10 story building with lots of transfer slabs. I don't see how the number of stories would appreciably affect the load distribution. 1) Exterior columns get 50% of the adjacent panel. 2) Interior columns adjacent to exterior columns get 65% of the exterior side panel and 50% of the interior side panel. 3) All other columns get 50% of the panels on either side of the column. Of course, you have to keep your wits about you and not apply these algorithms where they would be questionable. I'd use the limitations for 318 direct design method as my guide. If the direct design method wouldn't apply to your slab, then you should probably get a little fancier with your tributary areas. Transfer slabs get trickier still as the deformation of the transfer slab may change the distribution of loading among the various columns. This is pretty difficult stuff to capture without an FEM model though. When it doubt, do up your floor plate in something like RAM Concept, mesh it and apply a 1kPa unit area load. The reactions are now your trib area that will account for continuity. See what the difference against your hand/traditional calculated trib area. I think what OP meant was the effect of load distribution effects compound the higher you go. 50kN difference at a single floor can add up when you have a 80 storey building Vs a 5 storey building. I don't buy it. It should be relative. 8% off on a 50 storey building shouldn't matter any more than 8% off on a two story building. As I clicked submit on that post, I thought about the same thing. SlideRuleEra - Except that this bit of code applies to everything, and there isn't any situation (besides maybe joist/beam system) where it would be accurate. Ganesh Persaud - Tributary area works for steel/wood very well, but concrete has continuity, which changes support reactions. In a continuous uniformly loaded beam with similar spans, interior supports will be about 10% higher and exterior supports will be about 10% lower than a beam with no continuity. And I looked for a while through ACI 318; couldn't find specific guidelines on this issue. KootK - Thanks for the guidelines about trib area. At this point, I'm just going to build an FEM model. Trenno - Makes sense; the effects are relative despite size of building. I realize it's a mental thing to think that the effects are greater in a taller building. At this point, I'm just going to build an FEM model. Excellent. The method that Trenno described is exactly what I'd do. Interestingly, even that isn't perfect though. Any pattern floor loading will affect distribution. At the end of the day, all roads lead back to a reasonable estimate and an appropriate factor of safety. I would use the worst of the 2 methods for any column which is basically Koots approximation. - construction sequence effects that a single floor or a full building analysis will not account for. - said analyses will not account for cracking and other effects on deflections and load distributions including PT. - long term effects on column shortening can redistribute effects a lot. If edge and interior columns are the same size, creep will be much higher in internal columns, pushing load back to the edge columns. rapt - Thanks for the response. Because of all those variables, I decided to use an FEM-supported analysis for internal columns and KootK's method for exterior columns, or other columns where I feel that FEM would get lower loads. Keep in mind that a conventional FEM analysis wouldn't capture the effects that rapt and I mentioned. You'd need to be working an FEM model that deals with staged construction. ETAB Ultimate etc. KootK - Thanks for the comment. I've been doing research on those effects all day and I killed some brain cells, but only the bad ones. I'll do a staged construction dead load case and get axial loads with 1.2(DL staged)+1.2SDL+1.6L (or 1.4DL case, etc). For creep/shrinkage in the long term, it seems like the best way to deal with it is to have a symmetrical layout to avoid differential shortening and allow partitions/facades to deflect. It doesn't necessarily need to be a symmetric layout - it's all about keeping the stress levels across your vertical elements similar. The main thing is to allow for continuity at the first interior columns. Depending on the number of spans, it can be 10 to 15% higher than just the tributary area load. I use 1.15. Then, for the column design, take advantage of applicable live load reductions. Trenno - Thanks for the tip! I will proportion my columns accordingly. I'll take concrete stress only; too hard to analyze otherwise. hokie66 - I think that live load reductions don't matter for mid rises. Most of the time, it's minimum reinforcement at higher levels, a few bigger bars for lower levels. Not really worth the time to calculate. Punching shear will usually size the column. Make sure you include load bearing walls at similar stress levels under gravity load. We find the main problem is when walls which are highly stressed under wind/earthquake loading but relatively lightly stressed under gravity load are mixed with columns which are highly stressed under gravity load. I know of at least one building where the lifts would not run in an asymmetrical building layout due to the sway deflection due to differential shortening under gravity loads and creep causing large sway deflection. Interesting one rapt. How do you overcome this? The vertical element shortening effects are valid but, at only ten stories, I don't see those adding up to too much. Much more significant, in my opinion, is the sag in the transfer slab beneath transferred columns that that will, in a way, mimic shortening in a very soft column. The sketch below says it way better than I ever could. Nice graphic KootK. Really makes it clear what you're talking about. Short of using a more advanced analysis (ETAB Ultimate), how do you typically go about modeling and designing around sequential construction effects like the one in the figure you showed? I imagine you could manually force sag displacements in something like RISA or STAAD based on some hand calculations to simulate the sequential effects, but this seems tedious for such a large structure where those effects would apply. If I'm not mistaken, one way to account for these effects is to design transfers to more stringent deflection criteria (ie span/500 - span/1000). KootK, what is the axial force in column 1-2 on grid B? Is it 2.5 times the compression from normal unstaged analysis, or is it actually in tension (trying to hang from the upper floors)? Or something else? Here is the the link of where that screenshot is taken from. 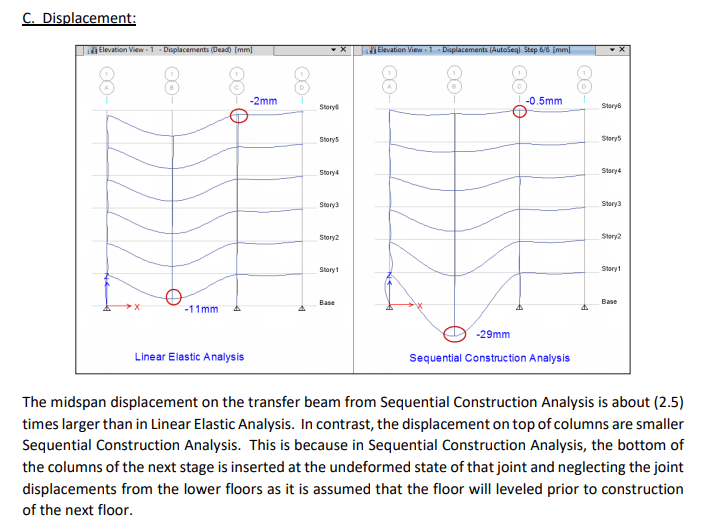 In most cases, the antidote is the normal practice of designing the transfer slab in a 2D model independently of the carrying capacities and stiffnesses of the floors above. But yeah, you want a transfer stiff enough that you're not taxing upper level framing in significant, unexpected ways. And then you get differential creep in the columns over the construction period that changes this further. Plus shrinkage, creep and cracking in the transfer member. And then you stage prestress the transfer and the results are even closer to the independent 2D transfer beam/slab using tributary areas for the column loads! So unless you can do the full building analysis allowing for stage construction, all non-linear effects and everything else, adopt the worst of full building elastic FEM and tributary areas for each column. You either size the columns to be stressed more closely to the stress levels in the walls (architect trouble), or you artificially increase the axial stress in the walls by vertically prestressing them down to the foundations. Agreed. That's what I'd proposed in my previous post.